The thirteenth century. Shortly after Kublai Khan conquers what would one day be known as Korea, he is approached by Chi You, the god of war. Chi You convinces him to take his Mongol forces and invade Japan. In 1274, Khan does just that, but his Mongols are fended off by a samurai wielding a magic sword during the battle of Torikai-Gata. Storytime over, Toru gets to the point: He thinks the Foot Clan knows where the sword is and he wants it. Karai laughs at him, but Toru insists that his desire is not out of his own superstition, but to play on the superstition of his "unreasonable" enemies. Having the sword would give him a psychological advantage over them. Karai reveals that the sword was obtained by the Foot Clan during the Muromachi period, but Takeshi Tatsuo hid it away in Hokkaido along with other artifacts of power. Considering the search for the sword a worthy challenge, Karai decides to contemplate Toru's offer further. A few days later, while sparring with Toshiro, Karai tells him that she has decided to find the sword. 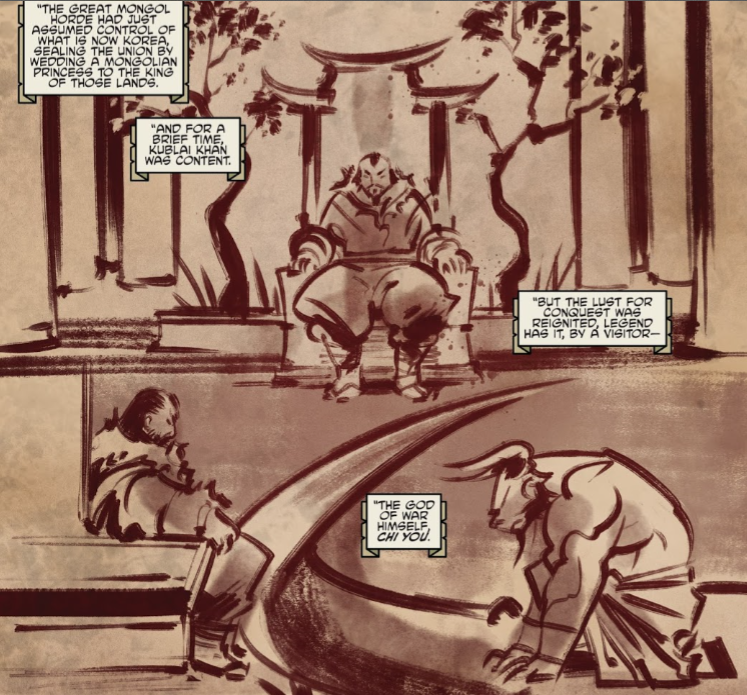 Toshiro warns her that desecrating its resting place is forbidden by The Secret of the Foot, but Karai insists that with her ties to the Clan broken, she's free to do as she pleases. Toshiro warns that he cannot assist her in this endeavor. Later, Karai, Koya and Bludgeon are airdropped into a forest in Hokkaido. Koya is furious about being dropped in a crate and attacks Karai, who gets the better of her and orders her to make a choice: Either succumb to her self-loathing and be executed on the spot, or learn to find a new path in life with her help. Koya chooses the later and the trio presses on. 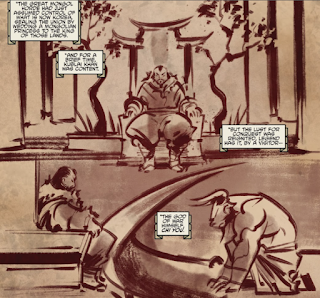 They soon get lost and Karai decides to meditate to search for an answer. In her vision, she is met by a Dragon (whom she initially mistakes for Oroku Saki). 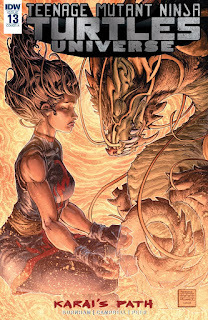 She asks the Dragon to help her find the resting place of the sword and it obliges. Karai awakens from her trance, now knowing exactly where the sword is, and beckons her mutants to follow. Koya returns from her vision, singed all over, and Bludgeon nurses her back to health. She tells him what she saw, but he doesn't believe her. He thinks her experience might have something to do with the talisman she took from the cave, but Koya snaps at him and says she can show him where it happened. *This story is continued from TMNT Universe #12. The story continues in TMNT Universe #14. *Chi You last appeared in TMNT/Ghostbusters #4, though he was most recently mentioned in TMNT (IDW) #71. A Dragon in relation to Oroku Saki was mentioned in that same issue (related to this Dragon who was mistaken for Oroku Saki? Maybe...). 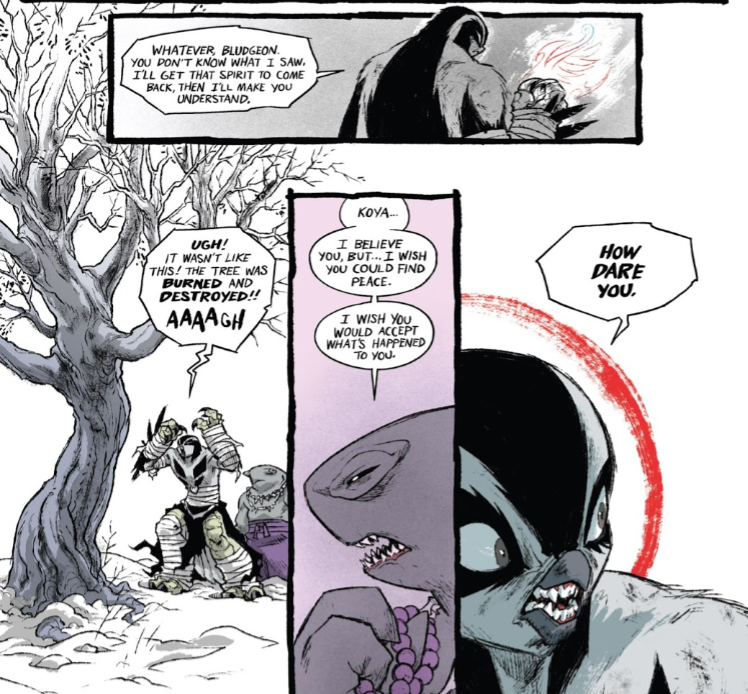 *In case you need a refresher, Takeshi Tatsuo was Oroku Saki's previous identity before he was reincarnated, as chronicled in TMNT: The Secret History of the Foot Clan #1. *Karai mentions to the Dragon that she has been visited by ghosts in dreams before and recalls the cuts on her hand she received from Oroku Saki's spirit in TMNT Villains Microseries #5: Karai. *This issue was originally published with 3 variant covers: Cover A by Freddie E. Williams II, Cover B by Sophie Campbell, and Incentive Cover by Becky Cloonan. All this stuff tying back into The Secret History of the Foot Clan is a pleasant surprise. I adored that miniseries and in a lot of ways it felt like it REALLY laid the foundation for the IDW Ninja Turtles mythology. The main book had been chugging along at a modest quality level before then, but I view Secret History as the title's ultimate gamechanger and the point where I was finally all-in. It makes sense that now would be a good time to start reviving some of those lingering threads. With the narrative of "Karai's Path" taking place in Japan, it seems pretty intuitive. But it also works for Karai's character, as looking back at her Clan's ancient history is helping her find the new direction she's been searching for. The ideas all tie together in such an organic way you can't help but appreciate how well it all reads. There are callbacks to other stories in the TMNT series, from Chi You to Karai's visitation from Oroku Saki's spirit. The inclusion of the Dragon, whom Karai initially mistakes for the Shredder, was particularly curious. 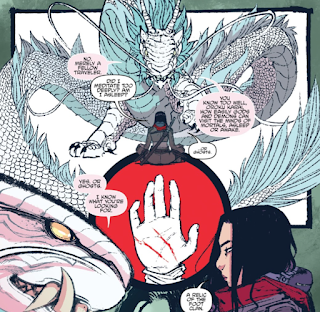 The recent "Feast of the Pantheon" story arc in the main series featured Kitsune mentioning that she was cultivating the Shredder into becoming the vessel for the Dragon, her deceased father. 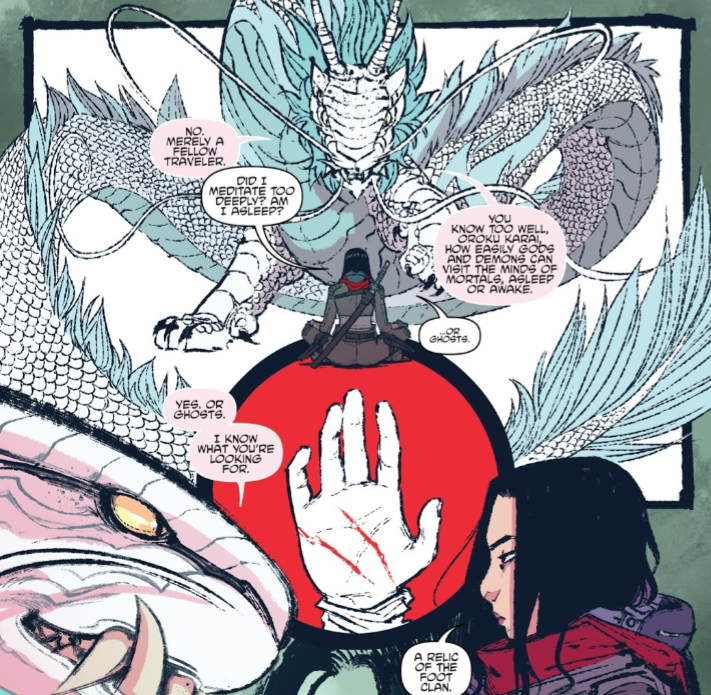 And in this issue, not only is the Dragon initially mistaken for Saki, but he puts emphasis on the fact that Karai has been visited by ghosts in her dreams. Honestly, if this isn't all part of the ongoing Pantheon subplot, I'd be really surprised. More interesting is that we're getting some characterization for the Foot Mutants. I really like Koya as a character. She's angsty and angry but in such an immature and impatient way. She hates losing and throws tantrums. Honestly, she comes across like a female Raphael. I also like one of Campbell's details on her: that she has teeth. Anthropomorphic avian characters tend not to be drawn with teeth (because birds don't have them), but the added feature makes her look appropriately monstrous when the situation calls for it. She can snarl and grit and it helps her to emote so much more. Bludgeon's finally getting some characterization, but it seems to be developing in reaction to Koya's established attitude. So I guess Bludgeon is easy-going and accepting of fate, maintaining a calm, zen-like attitude? Is that it? Pretty boring, but at least we have something to go on. Honestly, with the shark-tooth necklace and all the beads, he comes across less like a meditative guru and more like a surfing instructor. You know, the stereotypical Hawaiin surf master who teaches the youngsters how to sense the waves and become one with the curl and all that? Hey, I'll take it. And then the zombies attack, because now the story is REALLY pandering my way. As for the back-up, I guess the main plot hasn't caught up to it, yet (Bludgeon mentions that Koya took the talisman from the cave, so I suppose "Prey" is actually a sequel to "Karai's Path" just being run simultaneously with it). Campbell infuses a lot of humor into Koya in these pages, as she matter-of-factly arrives home, burnt to a crisp, then throws a hissy-fit when she finds the tree still standing and unscathed. I guess Koya is a character I like more for the way she's drawn; her personality is better expressed through her art than through her dialogue. Her raging hate-on for Leo and the Turtles is something I hope we see revived in the main book. I'd rather Koya keep that grudge burning than "get over it" without a rematch. 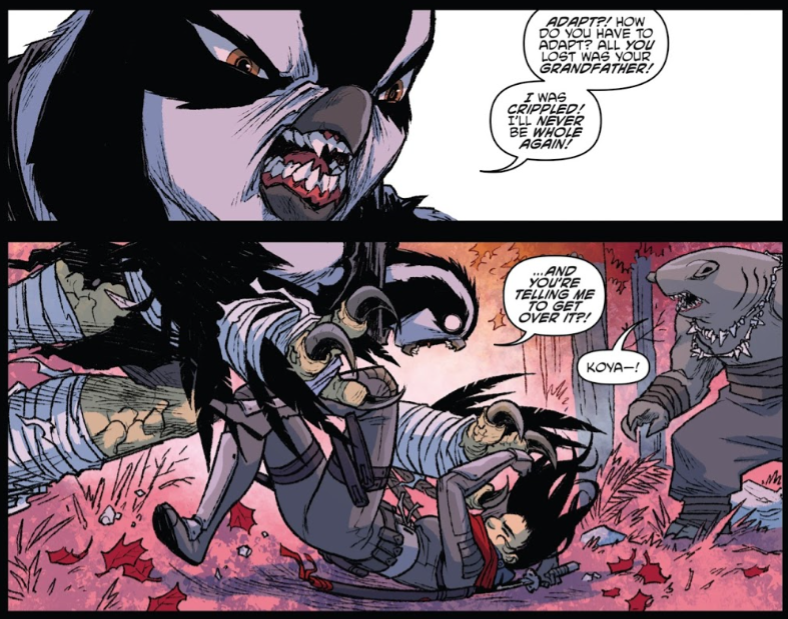 "Karai's Path" is really kicking it up a notch and I'm digging it a lot more now than when it started. Lots of mythology elements are woven into the plot, but in such a way that I don't think you have to be an IDW TMNT scholar to follow it all. The characters who had been all-but-forgotten for two years are coming back with a vengeance and I'm liking them more now than ever before. Koya's teeth kinda freaked me out. Have her teeth been noticeable in any of her previous comic appearances? I want to make a comment on the teeth as well. As I was looking at the comic pages, I couldn't pull my gaze off of those teeth. I have seen birds with teeth before in other animations, but Koya's teeth makes her look demonic. I honestly thought a shark mutant would be the most terrifying of the two, but Koya beats Bludgeon in the intimidation department. I like how they are developing the Foot Clan and how Shredder seems to have a connection with the Pantheon. I wonder if IDW will make Che'rell be inspired by this incarnation of Shredder to be the new Shredder similar to the 2003 animated series. Bludgeon may be mellower than Koya, but Sophie draws him absolutely adorable (and I've told her this). He certainly wears those monk-like clothes well, and the Buddhist prayer beads are a nice touch. I don't actually find him boring—I find him...serene, measured, patient, spiritual. 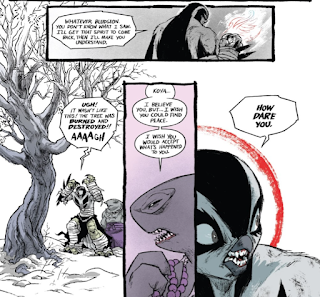 With Bludgeon coming off more as a hallowed monk than a stereotypical killer mutant shark, his character has suddenly become vastly more interesting than it ever was before.